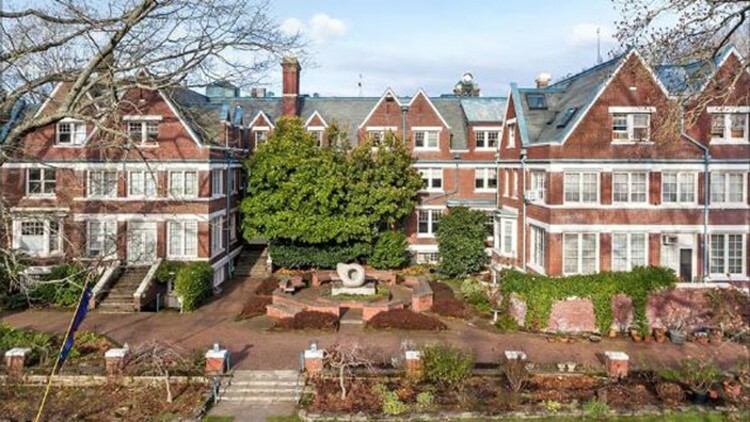 The Mann Home, built in 1910 and expanded in 1953 and 1993 has been listed by its current owners, the Movement Center, according to the Portland Business Journal. The Mann Home, built in 1910 and expanded in 1953 and 1993, has been listed by its current owners, the Movement Center. PORTLAND, Ore. — The Mann Home, built in 1910 and expanded in 1953 and 1993, has been listed by its current owners, the Movement Center, according to the Portland Business Journal. It first was christened the Anna Lewis Mann Old People's Home, honoring the wife of real estate entrepreneur Peter John Mann. The manor is 62,000 square feet, with 61 bedrooms, 39 bathrooms and a full commercial kitchen. A passing motorist would likely miss the estate. A pedestrian would spot it peeking through gaps in a laurel hedge. The Movement Center wants to downsize with a relocation to Southern Oregon or Northern California, spokesman Swami Prakashananda said.